The Tsunami waves that flattened a good part of South and South-East Asia on Sunday are being considered one of the biggest natural disasters ever witnessed by mankind. The sheer sweep of the disaster is cataclysmic. Pakistani students and senior citizens could not ask for more from India. As part of its policy of concentrating on confidence-building measures for improving relations with its western neighbour, India has opened the doors of its educational institutions to Pakistani students. The law of averages is all too familiar. Less familiar is the law of beverages, which is yet to be defined and refined. What is undeniable is that such a law exists and operates. How else does one explain the trend of a particular beverage catching the consumers’ fancy on a large scale. LIKE some other stray remarks that can sometimes be more crucial than formal policy pronouncements at august forums, former Prime Minister and most respected BJP leader, Atal Behari Vajpayee’s sudden disclosure — that the “real architect” of the 1998 nuclear tests was P.V. Narasimha Rao — has created a sensation across the country. EVERY December, as Christmas draws near, I cannot but help mourn the passing of the grace that once marked traditional celebrations in our cities and towns. The value of those traditional celebrations was that they kept alive the spirit that is associated with the season of goodwill and cheer. Mr Atal Bihari Vajpayee in an obituary tribute to late Narasimha Rao has now acknowledged the latter as the true father of Shakti nuclear test of May 11, 1998. If only he had done it on the day of the test he could have avoided the divisiveness that was created in the country at that time. The Tsunami waves that flattened a good part of South and South-East Asia on Sunday are being considered one of the biggest natural disasters ever witnessed by mankind. The sheer sweep of the disaster is cataclysmic. People as far away as Africa have been affected. To that extent, it can indeed be called a global tragedy. The loss of human lives is staggering before which nobody has the heart or the inclination to calculate the loss to property. Suffice it to say that the wounds of this unexpected attack will take decades to heal. The standard drill after any such tragedy has three stages: rescue, relief and rehabilitation. The first part is almost over, with all concerned doing the best they could under the circumstances. The next two will require a Herculean effort the like of which the world may have never seen before. It has to be commensurate with the scale of the calamity. Needless to say that there is no government or agency on earth which can undertake it on its own. The Sri Lankan government has admitted that in so many words. Others have kept silent but their limitations are also a known fact. The long trail of pain and misery can be obliterated somewhat only if the entire humankind rises as one to the aid of their brethren who were in the direct line of the merciless annihilator. The unfortunate ones need help in every conceivable way: money, manpower, medicines, material …. There have been many such hours of trial in the past during which the milk of humanity not only flowed but also overflowed. But compared to the present catastrophe, they were only minor trailers. Now is the time when the world has to give its all to prove to itself that “Vasudhaiva Kutambakam (the whole world is a family)” is not just a slogan. Nature has proved how ruthless it can be. It is the turn of the human beings to show how integrated and resourceful they can be. The sea fury can kill many and damage a lot. But it cannot decimate the never-say-die spirit of the human race. Pakistani students and senior citizens could not ask for more from India. As part of its policy of concentrating on confidence-building measures for improving relations with its western neighbour, India has opened the doors of its educational institutions to Pakistani students. Though they will be issued visas on a case-by-case basis, the Indian gesture enables them to get admissions to its premier institutions like the IIMs and the IITs, brand names at the international level, and receive world-class education by spending what they would be doing at home. India has also relaxed the visa regime for Pakistanis above 65 years of age and those below 12, and the people travelling in groups. These unilateral decisions, including free treatment to children suffering from heart ailments, should boost the India-Pakistan composite dialogue process. India had announced visa relaxation earlier also —- before the New York meeting between Prime Minister Manmohan Singh and President Pervez Musharraf on the sidelines of the UN annual session. Among the beneficiaries then were Pakistani academicians, journalists, doctors and those in the 65 plus age group, who were exempted from reporting to the police. These Pakistanis can now visit up to 12 places against the earlier practice of allowing them access to only three cities or towns. Without waiting for Pakistan to reciprocate, India has gone ahead with fresh concessions to Pakistani citizens. All this is an expression of India’s conviction that confidence-building measures can go a long way in creating an atmosphere congenial for friendly relations between the two neighbours. India’s stress on CBMs and promoting people-to-people contacts is primarily aimed at reducing the “trust deficit” —- to use Pakistan Prime Minister Shaukat Aziz’s expression —- which has been coming in the way of untying the Kashmir knot. The strategy has evoked appreciation from influential world capitals. Pakistan too should realise its significance and reciprocate the decisions taken by India unilaterally. However, all these will lose their meaning if terrorists continue to be allowed to use Pakistani territory to cause death and destruction in India, contrary to General Musharraf’s January 2004 commitment. The law of averages is all too familiar. Less familiar is the law of beverages, which is yet to be defined and refined. What is undeniable is that such a law exists and operates. How else does one explain the trend of a particular beverage catching the consumers’ fancy on a large scale. The flavour of the season is coffee, and conspicuously so. Few beverages can match the aroma of the roasted beans that are ground and brewed into a variety of irresistible concoctions. The trend is catching on in India too. Even in tea-drinking northern India, coffee is more ‘in’. Coffee is fashionable and, like all fashions, has brought in its wake the branded sellers of the heady brew who want to cash in on the trend. Thus, we have Barista, Mr Beans and Coffee Day, all opening up shops in their expanding chain, offering a variety of selections that was rarely tasted before in this country. Of course, Starbucks, the American chain, is yet to make its presence felt in these parts, but the day may not be far off. On the flip side, taste is a casualty. India could boast of good coffee long before these brands arrived. Yet few were lured to taste a cuppa, especially in northern India. In fact, to promote and popularize coffee in the North, the Coffee Board priced the beans at less than what it sold for in the southern states. Ironically, more consumers preferred the instant variety to the real stuff. In David Mitchell’s enthralling futuristic novel ‘Cloud Atlas’, which missed the Booker by a whisker, coffee is simply ‘starbucks’ with a small ‘s’. Well, so it might be in time to come, when we may begin ordering barista or misterbeans instead of ‘coffee’ as the pure, original stuff is called. The confidence and faith of the heart alone make both God and an ideal. Understandably, for Mr Vajpayee said at a literary meeting at Gwalior that while Rao was demitting office in May 1996, he had handed him a “piece of paper that contained brief information about preparations for nuclear explosion at Pokhran (and) suggested continuing with these preparations, as neighbours (China and Pakistan) already possessed nuclear weapons”. The note, the BJP leader added, had brought him “joy” and also “stunned me”. This should hopefully go some way to clear up the confusion about the evolution of the country’s nuclear policy and programme which has been caused partly by astonishing and surprisingly widespread ignorance even in decision-making circles and partly by the polity’s endless discord that has made the nuclear issue a plaything of partisan politics. Ironically, the first point to be made in the present context is that what Atalji has revealed is not so great a secret as it might appear. For, it has been well known to the cognoscenti both here and abroad. Indeed, foreigners know more than do most Indians. However, it is important that the country has heard about what had actually transpired from the horse’s mouth, so to speak. What Mr Vajpayee has not cared to mention is that the Shakti series of nuclear tests would have been conducted two years before they actually were had not his first government turned out to be a 13-day wonder. Consequently, Rao confidentially repeated to Mr Deve Gowda the advice he had earlier given Atalji. The backdrop to these events is crystal clear but it has either not sunk in public consciousness or is being wilfully ignored. Jawaharlal Nehru, who once said that “every pore” of his body “abhorred” nuclear weapons, was equally adamant that he could not “bind” future Parliaments and future generations to using nuclear energy for peaceful purposes only while other countries obstinately persisted in making military use of this technology. On a famous occasion in 1957 when the great nuclear scientist and first Chairman of the Atomic Energy Commission, Homi Bhaba, suggested to the Prime Minister that India should forswear nuclear weapons and thus occupy the “moral high ground”, Nehru had replied, “Homi, come to me with this idea when we are close to being able to make the Bomb”. Incidentally, this also underscores how spurious is the general belief that Bhaba was a hawk about building the Bomb and Nehru was “restraining” him. Lal Bahadur Shastri, in whose time China became a nuclear weapon power just two years after the traumatic border war in the high Himalayas, did not confine himself to looking for a nuclear umbrella. During his short-lived tenure he also sanctioned SNEP (Subterranean Nuclear Explosion Project). But because of his sudden death, followed almost immediately by that of Bhaba, the project did not take off. It was Indira Gandhi who conducted the 1974 PNE (peaceful nuclear experiment). What was detonated was not a “nuclear device” but a “nuclear bomb”, as Raja Ramanna, the architect of that experiment confirmed years later. For various reasons, including international pressure and U.S. sanctions, she could not, or rather did not, take the necessary follow-up measures. Even in 1983 she again had to abandon renewed preparations for a second test — as Mr R. Venkataraman, her Defence Minister then and later President, has testified. The development of technology for the production of nuclear weapons continued, however. In 1988, Rajiv Gandhi authorised the weaponisation of the Indian nuclear programme. To his dismay, the international community had totally disregarded his three-phase plan to rid the world of nuclear weapons he had presented to the UN Special Conference on Disarmament. Worse, he had also discovered around that time that Pakistan had already produced a nuclear weapon, thanks to China’s help and America’s acquiescence. Thus, there was a period of at least a year during which Pakistan had the Bomb but this country didn’t. Mr Vajpayee discreetly acknowledged this in the course of his remarks at Gwalior. That is where the irony of the Narasimha Rao years comes in. He was scrupulously following the policies of Indira Gandhi and Rajiv Gandhi and pursuing their nuclear and missile programmes. But he was doing it in his own way and even let the impression grow that he had put these ventures in “cold storage” under American pressure. The sad story of the last-minute cancellation of the December 1995 nuclear test is too well known to need recounting, though Rao has carried his version of what happened to his funeral pyre, as he had always said he would. The material fact is that one of the six weapons tested on May 11, 1998, was placed in the Pokhran shaft in 1995. Under these circumstances, what could have been more incomprehensible than that the Congress, especially some of its leaders, should have criticised the nuclear tests not only at that time but also much later? However, if the Congress side has been remiss on this score, the lapse of Mr Vajpayee and the BJP is much the greater. Mr Vajpayee, who now acknowledges that not only was Mr Rao, as Prime Minister, consulting him but also it was he who encouraged him to go ahead with a fresh blast at Pokhran, surely had a duty on the day the earth shook at Pokhran a second time. He should have taken Congress leaders, including Rao, into confidence at least after the tests had taken place. More, he should have invited not only PV and all other former Prime Ministers but also the Congress President, Mrs Sonia Gandhi, to be with him while announcing what was, and will always remain, a grand, national achievement. Instead, he staged a solo performance that the BJP mindlessly converted into crassly partisan and jingoistic extravaganza. Only such a climate can give rise to the absurd notion that South Asia was nuclearised only in May 1998. The reality is that this had happened eight years earlier when both countries had developed nuclear weapons of their own. Innocent souls pretending that untested weapons don’t mean anything need to be reminded that the bomb that decimated Hiroshima was totally untested. Only the one dropped at Nagasaki later was. Jolly Santa Clauses radiating wit and kindliness entertained me for much of my schoolgoing years. Last year, I was saddened by the sight of a sloppily-dressed Santa Claus snarling at an auto-rickshaw driver at the entrance to a South Delhi department store. His ill grace only served to dilute visitors’ enjoyment of his subsequent attempts at waves and flourishes. Both he and the shop that had hired him for the day were paying only lip service to the Santa Claus tradition. As for New Year revelry, boisterous scenes a la Manali — a favoured New Year holiday destination for Delhi and Chandigarh — have become the order of the day. Around 11.30 pm on December 31 every year, the Mall in Manali is taken over by loud, half-drunken young men dancing jigs to Daler Mehndi hits in the middle of the carriageway. Empty bottles are rolled down the road at the turnabout. Vehicles packed with youths singing at the tops of their voices careen past, U-turn and drive down the street again. A bunch of mild-mannered, bemused cops stands about in the snow on the pavements or sits in their little hut at the taxi-stand, reluctant to interfere unless things go really out of hand. It’s all a far cry from my treasured memories of Christmas and New Year, many associated with the graceful organs and carols of choirs in the old stately churches of Calcutta a quarter of a century ago. Many of these memories are not mine but they never fail to make a lump rise in my throat. One of the most poignant stories ever recounted to me was by Brother Brendan MacCarthaigh, an Irish Christian Brother. One December, decades ago, he spent December 24 playing his clarinet for a group of orphaned children in Kalimpong for whom the Christian Brothers gave a Christmas party. The children’s eyes shone with such happiness and gratitude that, as he walked out at the end after playing “Ave Maria”, it was only when the cold air blew into his face that he realised his cheeks were wet. Another teacher friend, an Englishwoman who spent many years working in Calcutta, described how she had never forgotten a childhood Christmas on the family farm in England. Accompanying her father to feed the animals in the barn on Christmas Eve night, she was mesmerised when, for a brief moment, the legend of Christmas came alive as the oxen, rising to their feet in anticipation of hay, seemed to kneel as they are supposed to have done before the baby Jesus. In the Calcutta of the seventies, a week before Christmas, fairy lights would be strung overhead across the carriageway on Park Street — the hub of dining out as the city’s best restaurants and bars lined it, a few paces from one another. Shop windows and restaurant entrances would be decorated with fir trees and Santa Clauses and cotton wool for snow. On Christmas Eve itself, hawkers would lay out dozens of conical tinsel hats and paper bugles on the pavements. These were the only flagstones in the city that were not dug up by what was jokingly called the Calcutta Metropolitan Digging Authority rather than “development authority”. The morning after, confetti would be scattered all over the pavements. The crowds and the festivity would peak on December 31. In 1979, an amusing incident was noted by a local paper when it told readers of the man who took his young son and daughter to Park Street at midnight and loudly ordered them to note the significance of the occasion — the turn of decade. One wonders to what heights his enthusiasm for being part of history rose when not only the decade, but the century and, indeed, the millennium changed. However, it is better to be late than never, especially in this country where the political class and the bureaucracy have no sense of history and have not appreciated the need to get the correct historical perspective about very important decisions of the past. The present UPA government in which the Congress party plays the dominant role must have a detailed account of Narasimha Rao’s role on the evolution of Indian nuclear policy so that there will be no unnecessary discontinuity in the country’s security and foreign policy. 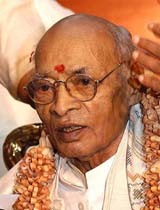 Narasimha Rao, President Venkataraman, Mr V.P. Singh, Dr Arunachalam, Dr A.P.J. Kalam and others gave their accounts on country’s nuclear polity evolution during the Kargil committee’s enquiry. While there is a chapter on the nuclear backdrop in the Kargil Review Committee Report, the full supporting documentation is available in the annexures. The committee itself , in the forwarding letter to the Prime Minister, had urged that the entire report, including the annexures, should be released to the public as the annexures had already been screened by the committee to ensure that no material that would hurt the country’s interests had been included. While the main report was released with minor security deletions (which were unnecessary in the committee’s view), the annexures have not been released. Recently, the National Security Adviser of the UPA government indicated that their release was under consideration of the government. Against this background let me bring out Narasimha Rao’s role in the development of Indian nuclear deterrent as narrated by him. When the Kargil Committee wrote to Rao that they would like to meet him, he asked me to meet him alone. He was President of IDSA from 1980 to 1987 when I was its director.We had therefore known each other over a period of years. He asked me what the Kargil Committee wanted to discuss with him. I mentioned Kashmir and the nuclear issues. He said he was agreeable to the former but not to the latter. I asked him whether he did not owe it to the country and future generations to give his account of the evolution of the nuclear policy during his term of office. I also reminded him while I was not at the centre of decision-making on the nuclear issue I had been on the periphery of it. He said he was aware of it and he would be prepared to talk to me in my individual capacity but not to the Kargil Committee. When I again pressed him on his obligations to the future generations he said he had an obligation only to one person and he had discharged it to the full. When I asked him who that person was, he replied “Atalji who succeeded me. I have briefed him fully”. The Kargil Committee met him subsequently and I had earler warned my three colleagues that they should not raise questions on the nuclear issue. They (George Verghese, General Hazari and Satish Chandra) did not. The discussion focused mostly on Kashmir as it was handled during Rao’s premiership. At the end of the discussion George Verghese asked him in view of the Kashmir situation he had outlined why was the defence budget cut during his time. Rao replied that was because the nuclear deterrent was under development and that had priority. Then he proceeded to tell us on his own, how the nuclear arsenal was operationalised only during his premiership. Subsequently, a record of discussion, including what he told us on the progress of nuclear programme during his tenure, was sent to him,as was done in all other cases. I was wondering whether on second thoughts , he would cut out the portion on the nuclear issue. He did not, but signed the record as it was and returned it. One could understand why the NDA had an interest in not publishing the annexures of the Kargil report since the Rao account would have appropriated most of the credit for nuclear weapon developement to the Congress. The publication of the annexures at this stage would be to the advantage of UPA. Even during the period of Indira Gandhi and Rajiv the two senior leaders of the party who were in the picture on the nuclear programme were R. Venkataraman and Narasimha Rao. The account of Rao about the weapon being operationalised only during his period is supported by the account of Mr V.P. Singh in the Kargil report. Though the credit for the order to assemble the weapon goes to Rajiv Gandhi and the credit for restarting the development programme of the weapon after Morarji Desai halted it, belongs to Indira Gandhi it was Narasimha Rao who operationalised it. Indira Gandhi herself wanted to test an improved nuclear weapon design in 1983 when the Pokhran Shafts in which the Shakti tests were conducted were sunk. In other words there has been a consistent continuity in the Indian nuclear policy under the Congress governments. Even while working hard for nuclear disarmament the Congress Prime Ministers were hardheaded people who did not put all their eggs in the only basket of nuclear disarmament. During the time when Rao was Prime Minister, when India was under consideratble pressure from the US to roll back its nuclear programme, he appears to have kept Mr Vajpayee informed of the progress in the nuclear programme. The evidence of this is that there was no pressure from the BJP in Parliament on the nuclear issue though there was a widespread impression in the country that the programmes had been slowed down under US pressure. Unfortunately, Rao’s statesmanship in treating the nuclear issue as a nonpartisan national issue did not appear to have been reciprocated on the day of the Shakti tests. It is very significant that some of the most thoughtful and cultured men are partisans of a pure vegetable diet. Do not give anything without considering the need of the taker. Giving should not abuse the dignity of the receiver. It should be in keeping with the welfare of the person and should genuinely uplift him. The real intention of help should be this. Even a brother’s faith may be swayed. As long as he believes his brother to be the greatest warrior, he claims to repose full faith in him. But when he sees another equally mighty, his faith turns into half-doubt. We must read it and realise the fact that God’s Will works through all phenomena that occur around us.